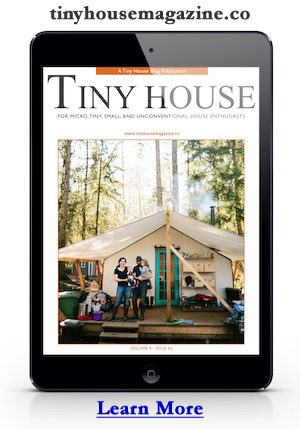 One of my New Year’s resolutions is to write more on specific tiny house design considerations. This first post is about two things that often get confused, thermal mass and insulation. Both can help regulate the temperature inside a home throughout the seasons but they work in very different ways. Together they can provide the best performance for keeping your home comfortable. Thermal Mass – This refers to the ability of a material to store heat energy. Typically in a home this would be materials like masonry like concrete, brick, adobe, rammed earth, and/or earthbags. A great example of how thermal mass works is an old uninsulated adobe house. During the day an old adobe will soak up the heat of the day and that heat will travel through the walls at a rate of 1 inch per hour. By the end of the day the walls are all charged up with heat which continues to travel into the interior of the house keeping the it warm throughout the night. As the night air cools the house from the exterior at 1 inch per hour the walls continue to keep the interior warm until the morning when the warmth of the previous day is finally exhausted. But now the walls are storing the cool of the night and pour it back into the house all day long. Really amazing simple physics people figured out a very long time ago. Insulation – This refers to the ability of a material to slow down the transfer of heat energy. Typically in a home this is fiberglass, foam, loose fill, and/or reflective materials. A good example is a home made of structural insulated panels which are basically big pieces of foam sandwiched between engineered sheathing like oriented strand board (OSB). Since these panels are mostly foam they can create an extremely tight super-insulated shell that keeps the air inside the house sealed from the temperature changes outside. While an old adobe can naturally regulate it’s temperature you can imagine how cold it might get in the winter after a series of cold sunless days. You might also realize how a super insulated house would rely on artificial heating and cooling systems to control the air temperature. Mixing the two is the basis of passive solar design. If your goal is to have a home that heats and cools itself naturally without much help from artificial heating and cooling systems then you mix materials that store heat energy and those that slow down heat transfer. Imagine a structure with a blend of insulated and masonry walls. The masonry walls are heated by the sun or fuels during the winter and protected from absorbing heat in summer by using insulation and shading. Ideally the masonry has layers of external insulation to help lock in the heat it gains from the sun. We’ve not seen a lot of passive solar design in tiny houses simply because mobility and heavy block walls conflict with each other and tiny insulated spaces are easy to heat with tiny wood stoves or propane heaters. But I think there are some very clever potential designs that would provide little living spaces that virtually maintain their temperature without much help from us. We just need to dream them up and get building. I’ve posted a few solar house plans and have more in the works. Be sure to see my free tiny house plans and the tiny solar house plans which are available for $9.99. This entry was posted in How To and tagged alternative energy, insulation, passive solar, solar, sustainable architecture, thermal mass. Are you in Georgia near John’s Creek or Alpharetta? You’ve left out logs as a typical building material providing thermal mass. The logs in a log home provide insulative value but more importantly thermal mass which is why they are so comfortable in a colder climate. This in in spite of the insulation value of wood taken alone not being all that great. Also, not sure why you refer to adobe as ‘old’. There are plenty of new mud brick buildings still being built. Even in our climate you might not add insulation but you might build a double wall with an air gap on the coldest side of the house. You can also combine insulative value and thermal mass with materials such as ‘light earth’ or Leichtlehmbau in the original German. This is a clay straw ( like cob but with more straw than clay) which is therefore lighter than straight cob or adobe while still providing thermal mass. This might be an option for tiny houses on trailers – at least maybe to fill in a few if not all of the stud spaces with light earth. This probably would have to be balanced by putting some on both sides of the trailer, perhaps above the wheels). Thanks Steve… you’re right there are more materials, like logs, that can be used. I used the words “old adobe” because many “modern adobes” and other earthen buildings use modern enhancements like exterior insulation and high-performance windows, passive solar design, and roof insulation to enhance the performance of the earthen walls. The point I was trying to make is that old adobes, or any simple earthen structures (or, stone, log, etc) without any modern technology can work great all by themselves without any modern cleverness. Interesting idea about the dire in the walls. In fact it could also be used to balance the tongue weight of the trailer and as long as the overall weight didn’t get to carried away it would most likely help regulate the temperature. Good thinking Steve! While thermal mass may not be great for the tiny houses on trailers, it could work for those small cabins and such. Of course the tiny size of the house makes its mass smaller compared to a regular house. But using logs, cob, etc. could compensate for that too. A lot of ideas for the creative types out there. There is an important point which you imply in your post but could be missed…Thermal mass works great for regulating heat sources that are difficult or impossible to control directly, namely passive solar and wood heat. But if the heat source is thermostat-controlled gas or electric, there is no reason (that I can think of) for having thermal mass. Another factor to keep in mind is that the more thermal mass a house has, the longer it takes to warm up. If for example you are building a small weekend ski cabin, you should probably avoid thermal mass. You don’t want to get there on a Friday evening, light a fire, and then have to wait several hours for the place to heat up enough to take off your winter coats. Lastly, plain old drywall has a lot of thermal mass. Just putting up a double layer of drywall adds a lot of mass. For a tiny house on a trailer, though, containers of water that can be emptied while moving might be the best idea. Frank you’re absolutely right. I would add that thermal mass is great if you’re using natural heating and cooling. If you are using fossil fuels, wood, or electricity heating up the mass will take much more energy than heating up the air. So thermal mass is great for passive solar design but use caution when considering it for areas where costly (in time or money) fuels are needed. You might be far better off having a super insulated house and using an efficient heat source. Good point about drywall. Another major benefit of drywall is that it increases the fire rating and safety of the walls. I built an 8×8 room with 40 tons of sand ,cement and stone insulated on the outside to R40 with a R49 roof as a heating appliance addition to my less than 400 sq.ft. house. Inside is a full sized, cast iron, airtight stove ducted through the roof with triple wall pipe so no stonework is exposed to outside temps Tonight I left with only a small fire burning thinking I would return shortly, 6 hours later with the fire mostly out the inside temp had only lost 6 degrees despite it being 15 degrees outside. With walls 1.5 to 2.5 feet thick there is not much room left but for some wood, fireplace tools and a chair and a clothesline near the ceiling. Sounds like a great example of thermal mass battery! Love to see a photo if you don’t mind sharing. Thanks! My old digital camera is not compatable with my newer laptop, hopefully when work picks up (starts?) I will buy a new one. What about thermal mass in the floor instead of walls? No need to worry about balancing tongue weight then. Even with electric heat thermal mass keep indoor temps from fluctuating. Takes longer to warm up/cool down. Mostly I think this is a benefit. One aspect of insulation and thermal mass that is very frequently overlooked is the earth itself. Now this will seldom be useful for the trailer type of “house” but for those of us building more permanent tiny homes, using the earth itself can save us almost all of our heating and cooling costs. My own home will be an underground home, based upon the design and building methods of Mike Oehler, who emphasizes light and views, so as to prevent the U-home from seeming like a cave. Thus we can enjoy both a wonderfully comfortable home, and nearly completely refrain from heating or cooling no matter the environment as the interior will stay a constant temperature of approximately 55-60 F.
I’m planning a home in a temperate climate zone Vancouver island and am trying to come up with ideas to create thermal mass in the building economically and in places where it will do the most good. Has anyone ever recycled gyprock sheet ie, grind it up, add liquid and pour it into wall cavities maybe to create thermal mass. I believe gypsum is fairly good at absorbing and giving off heat. What would be the process in creating this mixture? would it have the same thermal mass quality, would it dry and cure in a wall, (form). We all know it’s readilly available. This “Mother Earth News” article describes an external solar heated water system for use in radiant floor heat: http://tinyurl.com/2r8nzd This design could be modified / scaled for the tiny house. Instead of a building, the solar water tank could be housed in an insulated box. The system could be drained, lightening it for transport. By virtue of it being external to the structure, weight concerns are eliminated entirely. Good floor insulation would be the only design prerequisite. What about having a wall with a tank in it that you could fill with water? Would that work as thermal mass? Or just use your water tank in a thermal mass-y sort of way? Thermal mass–no outside influence necessary. A well insulated structure with a considerable amount of thermal mass, like a cave or underground cavity, will maintain an almost constant temperature year around, completely ignoring outside influences. Body heat, waste heat from electronics and other incidental sources will keep such a structure warm, with the thermal mass moderating any extreme fluctuations. The trick is to insulate the thermal mass against the outdoors, something I haven’t seen done too often. Google the partial underground concrete home in Arizona for an interesting modification of ‘traditional’ ICF design. I’d been picturing waist height trombe wall , tripled glazed on the external (south) side, heanvily insulated on the top and rear but with openable vents, with the building’s water tanks and a rocket stove both embedded in it. No idea if this is feasible, though, so any thoughts appreciated.